Is Barolo still Italy’s greatest wine? It’s a question I’ve been mulling over for some time. And like some of life’s bigger questions (Is there a God? And what really constitutes a 100-point wine? ), it’s not one whose answer is readily known. Barolo, after all, has been called “the King of Wines” for centuries—never mind that it took a Frenchman to bring this about (more on that later). But what was a certainty some 200 years ago may not necessarily be true in 2007. After all, the Barolos of only two decades ago bear little resemblance to the wines of today. This is a consequence of what have been dramatically titled the “Barolo Wars,” with French oak and rotary fermenters and maybe a few Cabernet grapes as the weapons of choice. These are the armaments of so-called Modernists, producers whose mission has been to make Barolo a more contemporary and, as they might say, better wine. To Traditionalists, a.k.a. Classicists, this is nothing short of heresy. (In this way, the Barolo Wars seem a bit like the Crusades.) To Classicists, Barolo has always been, and should always be, made the same way: produced from the native Nebbiolo grape (a thin-skinned, rather acidic and tannic red), then generally aged in big Slovenian casks called botti in a particular (and very lengthy) way. This was more or less the model created by the Frenchman Louis Oudart back in the mid-19th century. When Oudart arrived in Piedmont, Barolo had been a simple, rustic, even sweet wine. Oudart been hired by the Marchesa of Barolo, who wanted something more noble to be created from her native red and believed a French wine consultant could do the job (a belief that the French have encouraged in various other parts of the wine world up through the present day). Oudart made such an impressive wine that other Piedmontese producers followed suit and a new style of Barolo was born, winning quite a few fans in the process—some of them even royals, like Vittorio Emanuele II, the first king of unified Italy (though probably best known today as a boulevard; I’ve yet to visit an Italian town that doesn’t have its own CorsoVittorio Emanuele). The style of wine Oudart created is the one that Traditionalists are still making today: wonderfully fragrant, with notes of bitter cherry, truffles, earth and even roses and tar; rather light-colored, quite high in acidity and very tannic, needing several years’ aging in barrel and bottle. In fact, by law Barolo must age a minimum of three years (at least two in barrel), though some producers age their wines longer. And even after Barolo is bottled, it requires many more years’ aging time. As famed Barolo producer Aldo Conterno once said, he made his wine to be “undrinkable” when it was first put into bottle. Modernists found this style off-putting, not to mention commercially challenging (how to explain to consumers that they could buy a wine but not drink it for a decade or two?) and sometimes even flawed (a wine might take so long to come around that the fruit was gone before the tannins ever softened). And so in the ‘80s, winemakers like Luciano Sandrone and Paolo Scavino, among many others, adopted some techniques employed by winemakers in other parts of the world, like a shorter maceration of the grapes (resulting in softer, less tannic wines, as tannins are extracted during the maceration process), rotary fermenters (another means of softening wine) and the use of smaller French barrels over big Slovenian casks. The result was a wine that was fruitier and easier to enjoy in its youth (sometimes even upon release), but one that Traditionalists argued lacked much of what made Barolo distinctive: its classic structure, powerful tannins and distinctive aromas. The modern wines were more like a lot of others and smelled mostly like French oak. They were also more pleasurable and less “intellectual”—the one word that Barolo Traditionalists invoke a lot. “Barolo is an intellectual’s wine” was the line I heard most often from sommeliers, wine merchants and collectors when I asked their thoughts on the wine. Barolo collectors, by the way, are almost always men. Why, I don’t know. Maybe wines with firm tannins are a measure of masculinity. Second only to the suggestion of Barolo’s “intellectuality” is the assertion of its resemblance to Burgundy: “Barolo is the Burgundy of Italy.” This can mean any number of things, though I’ve narrowed it down to three: First, Nebbiolo is a lot like Pinot Noir, the great red grape of Burgundy, in that it is also thin-skinned, difficult to grow and possessed of beguiling aromas. Second, Barolo, like Burgundy, requires its followers to memorize many names—not only dozens of producers (traditional and otherwise) but also names of communes and vineyards. And finally, like Burgundy, Barolo can be quite inconsistent. The highs are high and the lows, very low. And it doesn’t come cheap. More on this a bit later. 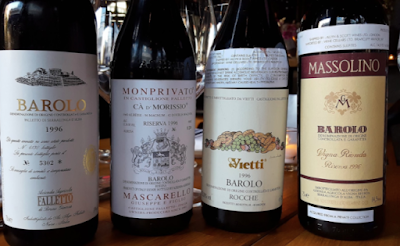 I’m not sure how much nebbiolo and pinot Noir ultimately do have in common (for example, few seem to be planting Nebbiolo in any other part of the world, nor is there a movie like Sideways extolling its charms). But in terms of geographic complexity, the Burgundy comparison seems to hold true. Barolo, like Burgundy, comes from a specific set of communes, of which there are eleven in Piedmont’s Langhe hills, although only five truly matter. And Barolo lovers describe the characteristics of these communes in as much detail as Burgophiles do vineyards of the Côte d’ Or. A few generalizations: The commune of Barolo produces wines famed for their concentration, while the wines from the neighboring La Morra commune are more “feminine.” The three other communes, Serralunga d’ Alba, Castig-lione Falletto and Monforte d’ Alba, are all located on Barolo’s eastern side, and they generally tend to produce wines that are bigger, more structured and slower to mature than those from the communes in the west. Within these five communes are hundreds of vineyards or crus, whose names may or may not appear on the bottle, and they too have different characteristics and varying degrees of fame. Some of the most famous include Brunate, Cannubi, Cannubi Boschis, Bussia and Fiasc—but, as with Burgundy, a single vineyard name isn’t necessarily a guarantee of greatness. A further complication that not even Burgundy can match is the fact that some of the best producers don’t make single-vineyard wines but blends. (Imagine a great Burgundy producer deciding to put a little Musigny into his Chambertin.) This was the general practice among most Barolo producers until Ceretto and others decided to bottle single-vineyard wines. 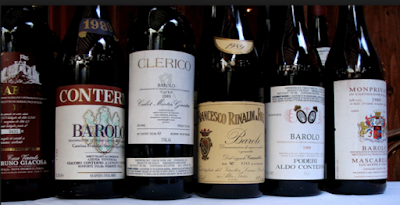 The latest Barolo vintage is 2003, and the wines were released fairly recently. That was the year of the great summer heat wave in Europe, and I expected the wines to be a little more accessible than traditional Barolo—lighter both in body and color, though still quite tannic and hard. These were the wines I was planning to taste when my friend Kate called to invite me to her dinner party. “ Barolo? Isn’t that a great Italian wine?” Kate said excitedly when I described my project to her. “Why don’t you bring some along?” I didn’t have time to explain that greatness was exactly the quality I was hoping to determine. To Kate, and to most people I know, “great” was just another word for expensive. I brought along five bottles of Barolo, all of them from the 2003 vintage, produced by both Modernists and Traditionalists. The Ca’ Rome’ Vigna Cerretta, a Modernist wine, proved the most popular, probably because it was the easiest to drink, with lots of sweet, ripe fruit. Second was the Cascina Bongiovanni, also made in a Modernist, fruit-forward style. 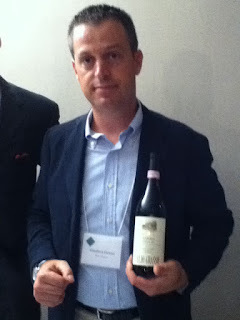 The Michele Chiarlo Cerequio, a compromise between Modernist and Traditionalist techniques, pleased the crowd with its depth, richness and high price (almost $100 a bottle) but was denounced for its lack of color (the guests didn’t realize that, with a few notable exceptions, Barolo is almost never a very dark wine). As for the also-ran wines, the Vietti Lazzarito Castiglione Falletto and the Marcarini, made by two excellent Traditionalist producers, were more difficult for the crowd to appreciate, mostly on account of their firm, tannic structure; both were fairly austere. Barolo may or may not be an intellectual’s wine, but this much is certain: It’s definitely not a wine for drinking with a crowd. I decided to taste the rest of the young Barolos myself. My solo experience, however, was inconclusive. The E. Pira & Figli and the Luigi Einaudi Cannubi, two Modernist wines from the great 2001 vintage, proved surprisingly lush and ripe, full of sweet fruit and soft tannins. But other 2001 Barolos were more difficult to assess at such a young age, like the impressively structured Domenico Clerico Ciabot Mentin Ginestra (Modernist) and the Vietti Brunate (Traditionalist), while some seemed to be mostly tannins and acid (the Modernist Prunotto). Perhaps the challenge wasn’t so much determining Barolo’s greatness but figuring out exactly what Barolo was. Could a Barolo that was enjoyable to drink at a relatively young age (six years or so) still be considered a great wine? Or even a Barolo at all? After all, one of the chief tenets of Traditionalist producers is that Barolo should not be ready to drink without 10 or 15 years of aging—and it should still have the capacity to develop for decades after that, too. Many of the wines I tasted were delicious and well made, but none seemed to have the structure of a wine that was potentially great except the Vietti Brunate and the Clerico—and yet they were made by two different types of producers, one Traditionalist, the other Modernist. Maybe what I needed was to taste wines from a vintage that Barolo makers themselves acknowledged was ready to drink. According to Luciano Sandrone, one of the most acclaimed of all Modernists, that vintage was 1996. I’d met Sandrone when he was in Manhattan to promote his 2003 wines—big, rich, intense Barolos that were still incredibly youthful. “ What about 1997?” I’d asked him. My friend Scott Manlin, a wine collector from Chicago, had mentioned he’d opened a bottle of 1997 Sandrone Cannubi Boschis—Sandrone’s most famous wine, which costs hundreds of dollars a bottle—a few weeks ago. “My friend Scott said the wine was terrific.” (Scott had actually said “Great juice,” but I wasn’t sure Sandrone would understand this as a compliment.) “That wine isn’t ready yet,” Sandrone replied.